Blood-sucking leeches are used in ancient Ayurvedic medical techniques. 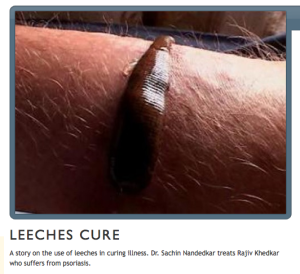 A story for the taboo series on the use of leeches in curing illness. 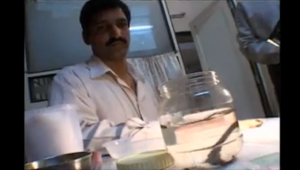 Dr. Sachin Nandedkar treats Rajiv Khedkar who suffers from psoriasis. Folk therapies often seem mysterious and are frequently portrayed as quackery—but they can also be effective. This program examines that paradox, crossing cultural and national boundaries to examine bizarre forms of medicine. Viewers may come to the realization that, despite the relevance and truthfulness of the term “snake oil salesman,” some folk remedies do have actual therapeutic or even curative properties. A National Geographic Production.